seeking amongst other things the protection of their witnesses. The Federal High Court sitting in Abuja has however fixed June 15 to rule on the prosecution’s application. 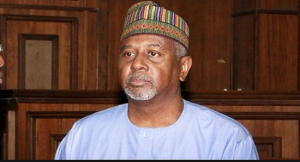 Justice Ahmed Mohammed on Thursday fixed the date to give his ruling on the application filed by the prosecution to protect their witnesses when giving evidence in the Federal Republic of Nigeria’s action against Colonel Dasuki on the seven charges of unlawful possession of firearms and money laundering against him. The prosecution applied to have their witnesses protected by giving evidence behind a screen, as they are security operatives and are at risk of harm. They stated that one of their principal witnesses, who could no longer attend court, had suffered an accident resulting in broken limbs while the circumstances of the accident have yet to be uncovered. The defence, however, opposed the prosecution's application on the ground that it was an abuse of courts process; a similar application haven been rejected by the court.